Pantau is a network of journalists, artists and photographers. Legally it is a non-profit foundation based in Jakarta. Its mission is to elevate the standards of Malay-language journalism. Pantau has three core activities: (1) Journalist trainings; (2) Media development programs; (3) Feature syndication. It has three offices: Jakarta, Banda Aceh and Ende on Flores Island. The Aceh office runs the feature services. The Ende office runs the media development programs. Jakarta coordinates the three offices as well as the training programs. Pantau is directed by a four-member board of directors: Andreas Harsono (chair), Agus Sopian, Budi Setiyono, and Indarwati Aminuddin. Linda Christanty heads the Aceh office while Esti Wahyuni heads the one in Ende on Flores Island. Harsono is a former Nieman Fellow on Journalism at Harvard University. He is currently writing a book on the intersection between media and nationalism in Indonesia: From Sabang to Merauke: Debunking the Myth of Indonesian Nationalism. Agus Sopian is a managing editor of the Jurnal Nasional daily in Jakarta. Budi Setiyono is a writer in Jakarta. Indarwati Aminuddin is the WWF coordinator in Kendari, southeastern Sulawesi. Linda Christanty is an award-winning writer who heads the Pantau Aceh. Esti Wahyuni works closely with the Flores Pos daily. Pantau also has two advisors. Artine Utomo, the CEO of TPI television in Jakarta, and RTS Masli, the former chairman of Indonesian Advertisement Agencies' Association, are members of Pantau's board of advisors. Masli is also the head of the Strategy advertising company in Jakarta. The journalists who are involved in this network are members of the mailing list pantau-kontributor@yahoogroups.com with 110 members. 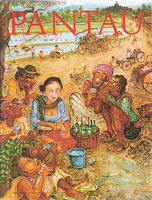 They used to be writers, artists and photographers for the now defunct Pantau magazine. The foundation also runs the website www.pantau.or.id that chronicles its activities and archives its magazine stories. Among younger journalists in Indonesia, Pantau is known as a pioneer of jurnalisme sastrawi (literary journalism). A book Jurnalisme Sastrawi: An Anthology of New Writing was published in November 2005. It also publishes the Indonesian version of Bill Kovach and Tom Rosenstiel's The Elements of Journalism" It works with an NGO for visually impaired people to also publish its Braille version. Pantau works with Columbia University’s Initiative for Policy Dialogue and Revenue Watch to publish some other books on journalism. Pantau also organizes many journalist trainings in places like Lampung, Balikpapan, Manokwari, Jayapura, Kendari, Manado, Makassar, Pontianak, Bali, Jember etc. In average, it organizes around 20 training and workshops annually over the last two years. Pantau also conducts a course on narrative reporting every semester since 2001. Its instructors are Janet Steele of George Washington University and Andreas Harsono of Pantau. In Jakarta, Pantau focuses its work on journalist training and writing courses. It regulary conducts a workshop on literary journalism headed by Janet Steele of George Washington University. Steele speaks Indonesian fluently and writes the book Wars Within on a Jakarta magazine. Every semester since 2001, Steele comes to Jakarta and heads this two-week course. A four-month writing course is also being held in Jakarta with Setiyono and Harsono. In Aceh, Pantau is working with Open Society Institute-Network Media Program to built the syndication, which provides feature service for mainstream and alternative media in Indonesia, Malaysia and East Timor. In Ende, Pantau is working with Swisscontact to help the Flores Pos daily in its editorial, design, advertising and circulation matters. It is also aimed to elevate the standards of journalism in Flores and western Timor.